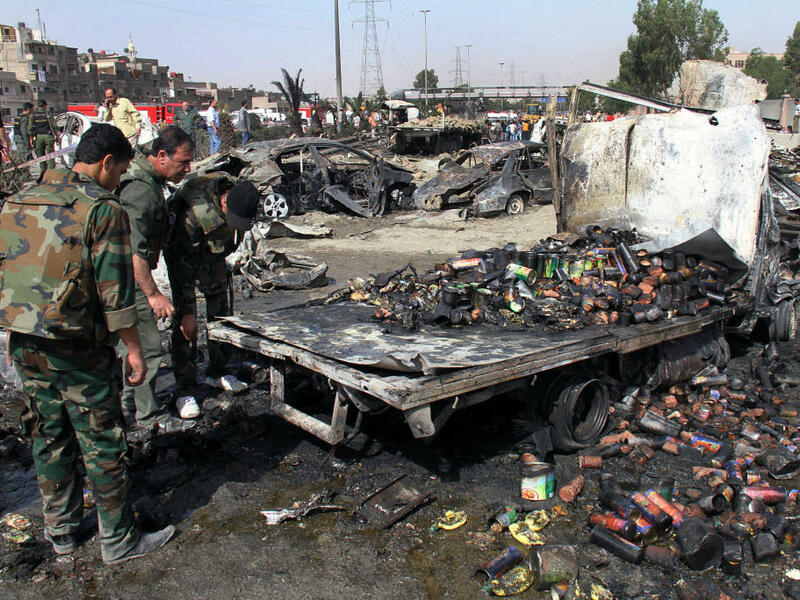 Syrian soldiers check a burned truck in front of a damaged military intelligence building where two bombs exploded, at Qazaz neighborhood in the Syrian capital, Damascus, on Thursday. The BBC reports that the two explosions occurred around 8 a.m. as people were heading to work – the first explosion apparently was calculated to attract people to the scene when a second, much larger blast occurred. Television showed mangled and burned-out vehicles and two large craters in the road. An al-Qaida-inspired group has claimed responsibility for several large explosions targeting mostly security facilities since December, raising fears that extremist groups are entering Syria's conflict and exploiting the chaos. The regime has used the bombings to support its claims that terrorists rather than a popular uprising are behind Syria's violence. Despite the attacks, President Bashar Assad's forces are firmly in control of central Damascus. The attack further threatens a shaky cease-fire worked out by the U.N. International envoy Kofi Annan condemned the attack and called on both the government and opposition fighters to respect the agreement. "These abhorrent acts are unacceptable and the violence in Syria must stop," Annan said in a statement released in Geneva. "Any action that serves to escalate tensions and raise the level of violence can only be counter-productive to the interests of all parties," he said.